An elderly Jaguar driver was once again caught on video hitting the side of a motorcyclist, five months after getting into an argument with another rider whom he sideswiped at Yio Chu Kang Road. 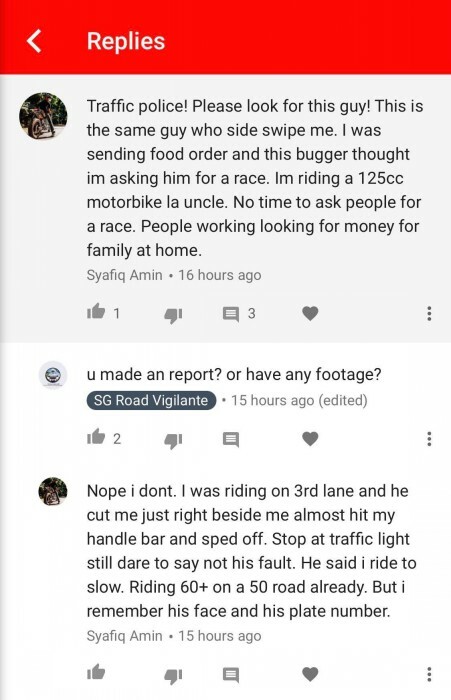 The motorcyclist involved in the latest incident, Abel Kenneth Pereira recounted the incident that happened on the Central Expressway (CTE) on Saturday (Sep 1) in a post on SG Road Vigilante's Facebook page. Fortunately, he managed to regain his balance and increased his speed to catch up to the Jaguar driver. "Thank god and lucky me, I managed to handle my bike well and managed to catch up with him and stop him," he wrote. "Or else he would have fled away!" His post also included a video where he confronted the Jaguar driver and asked him for his identity card. "Your IC I take photo then you chao," he is heard saying. "Never mind, your IC I take photo." In the video, the Jaguar driver shakes his head and his hand and looks like he is making to drive away. "Please be careful on the road!" Pereira wrote. "Life’s not cheap and it’s not worthy to face something which isn’t your mistake." Netizens slammed the Jaguar driver's reckless driving especially considering how this is not the first time the man's actions have been caught on video. When the motorcyclist sounded his horn at the driver, he got out of his car and said, "Why you driving like that (sic)?" Considering the number of times the driver has threatened the lives of other motorists on the road, netizens are calling for him to be "banned" from driving.